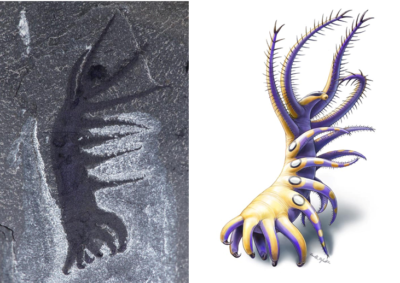 The fossil seen to the left was discovered in China in 2004, and was radiometrically dated to 525 million years old – the Cambrian Period. The organism was soft bodied and about 5-10cm-long (2-4 inches). It had a flattened body and horizontal fins which researchers think, could have been used to support it as it moved along the sea floor. It also had well developed senses, including a pair of eyes on stalks. This organism is clearly and animal, but it does not fit easily in any known phylum of animals (alive or extinct). 2. 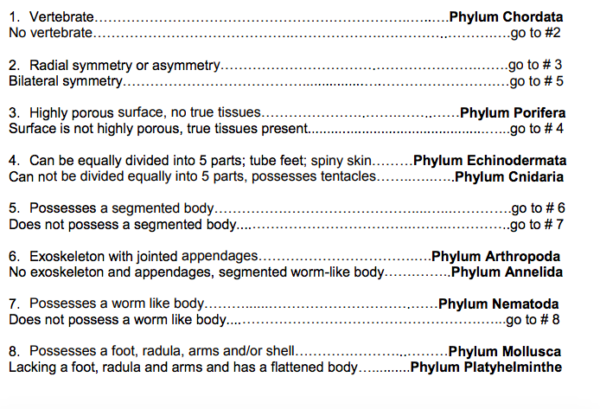 Use the the dichotomous key below, and the List of Phyla for Kindgdom Animalia (Wikipedia). 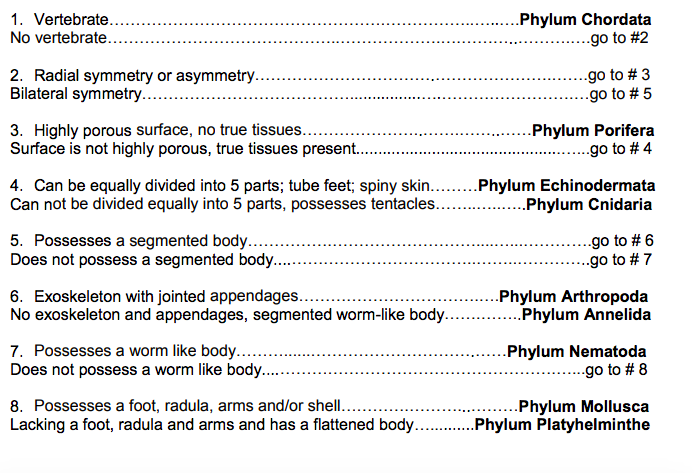 To determine which phylum you think this organism belonged to. One option is to decide it does not belong to any of the phylum’s listed. Assign one person in your group to look up any vocabulary words you do not recognize in the key or in your research. 3. After a period of time, your teacher will ask you to finalize your idea. Join your group to another two groups and share your ideas. Listen to their ideas. Use what you learn from the other groups to revise your answer and list of defining characteristics. 4. As a group write one clear paragraph explaining which phylum you selected and why.You should have a topic sentence that presents a clear scientific opinion as to which phylum this fossil belongs to. You should also provide at least three pieces of observable evidence to support your views. Write in third person (no I’s, you’s, or we’s). The fossil to the left, also found in China as part of a Burgess Shale deposit. 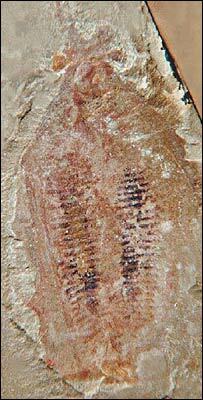 The fossil is a three cm long tubular organism, a tiny head and nine pairs of limbs. The first two pairs of limbs, just behind the head, are the longest, and are equipped with elongate spines so that they look like combs. Repeat the same procedure for Mystery Fossil #2. This time, you will write the paragraph individually. Use the rubric below to help you do your best work. Biological classification, like all science, goes through a constant process of revision. As new data becomes available we must revise our hypotheses. When radically new fossils are discovered it is sometimes necessary to redefine taxonomic groups or create new ones. Click here to read one group of experts opinions on mystery fossil #1. You can read about mystery fossil #2 here, and all of the other really weird fossils that came out of the Cambrian period here.